Fassel was replaced by current coach Tom Coughlin who has coached the team since 2004, also to inconsistent results and media scrutiny. The Giants acquired their current starting quarterback Eli Manning via a draft day trade from the San Diego Chargers. Manning had been the quarterback at University of Mississippi, and was the first pick in the 2004 NFL Draft. During this period standout Giants players include defensive end Michael Strahan, who set the NFL single season record in sacks in 2001, and running back Tiki Barber, who set a team record in rushing yards in 2005. 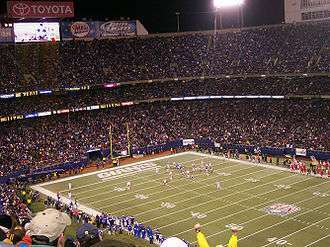 The Giants made the playoffs four consecutive seasons, from 2005–2008 (including a Super Bowl victory during the 2007 season), but missed the playoffs in 2009 and 2010. After finishing 11–5 and reaching the second round of the playoffs in 1993, the Giants took a step backwards in 1994. Phil Simms and Lawrence Taylor, the two biggest figures of the 1980s and early 1990s, both retired. Several other key starting players were dropped from the roster due to free agency. In the wake of Simms' retirement, head coach Dan Reeves named Dave Brown, who had been a No. 1 supplemental draft choice in 1992, as the Giants' new starting quarterback. Though Brown led the Giants to wins in their first three games of the season, the Giants lost their next 7 in a row to drop to 3–7. The poor play of Brown received much of the blame from fans and the media. However, the Giants recovered and won their last six games of the season, finishing with a 15–10 victory over the Dallas Cowboys at Giants Stadium. During this stretch they never allowed more than 20 points in a game, and the Giants ended the season with a record of 9–7. The team's stars included Rodney Hampton, who had his 4th straight 1,000 yard rushing season; second-year defensive lineman Michael Strahan, and linebackers Jessie Armstead and Michael Brooks. In 1995 the team regressed further, losing even more players to free agency and finished the season with a 5–11 record, their worst since Bill Parcells' first season in 1983. Quarterback Dave Brown was particularly disappointing, as he finished with just 2,814 yards and 11 touchdowns on the season. Reeves went public with his desire to have more of a say in personnel matters. He controlled the team's free agency decisions, but feuded with General manager (GM) George Young who chose the team's draft picks. Lowlights were a 35–0 loss to the Dallas Cowboys in the Monday Night season opener, and the fans pelting the Charger sideline with snowballs in the season's final game. Though the defense still played well at times, the Giants sent no players to the Pro Bowl for the second straight year. The Giants suffered through yet another poor season in 1996, finishing 6–10. Though Brown again started every game for the Giants he turned in one of the worst seasons of any starting quarterback in the league that year, throwing for 12 touchdowns against 20 interceptions. The Giants offense was one of the worst in the NFL and, unlike in previous years, the defense was unable to keep the offense afloat. After having one playoff appearance in four years, Reeves was dismissed after the 1996 season. The Giants hired Jim Fassel to replace Reeves before the 1997 season. Fassel had been the offensive coordinator for the Arizona Cardinals and Denver Broncos. After an opening day win against Philadelphia the Giants lost their next three games, including close losses to the Baltimore Ravens and St. Louis Rams. The Giants then won their next five games in a row. One of Fassel's biggest decisions during this streak was to replace Brown with second year quarterback Danny Kanell. The Giants won their next five game in a row to finish the season at 10–5–1, and win the NFC Eastern Division for the first time since 1990. In the first round, the Giants struggled in the fourth quarter, and the Vikings kicked a late field goal to defeat them, 23–22. After the 1997 season, Young, who as GM had helped build New York into a championship club in the 1980s, left the team to take a job in the NFL front office. He was replaced by Ernie Accorsi, a well-respected, veteran General Manager who had successful stints building the Baltimore Colts and Cleveland Browns. In 1998, the Giants were unable to build on their successful 1997 season, and needed a four-game winning streak to close out the season at 8–8. The Giants strength was their defense, which featured two Pro Bowlers in Armstead and Strahan. However, the offense continued to be a disappointment. Brown had been jettisoned and replaced by Kanell and Kent Graham. Neither quarterback provided Pro Bowl caliber play, although Graham led the Giants to a 5–1 finish (including an upset of the then-undefeated Denver Broncos in Week 15). Before the 1999 season the Giants signed quarterback Kerry Collins. Collins had been the first-ever draft choice of the expansion Carolina Panthers and in his second season led the Panthers to the NFC Championship game. However, problems with alcohol, conflicts with his teammates and questions about his character led to his release from the Panthers. Mike Ditka, coach of the New Orleans Saints signed him after his release; however the experiment failed and Collins was released again. Although many people, including Sports Illustrated football beat writer Peter King questioned the wisdom of Accorsi and the Giants giving Collins a US$16.9 million contract, especially when there was little interest for Collins's services league-wide, Accorsi was confident that Collins was a wise investment. The 1999 season featured many strong individual performances by the Giants, especially on offense. Receiver Amani Toomer had a breakout season, accumulating over 1100 yards receiving and six touchdowns. Fellow receiver Ike Hilliard also had a solid season, finishing just shy of 1000 yards receiving on the year. Tight end Pete Mitchell contributed 58 receptions, and Tiki Barber emerged as a premiere pass-catching running back, catching 66 passes on the year. The defense was also solid, ranking 11th in the league and sending Armstead and Strahan to the Pro Bowl again. Though the Giants stood at 7–6 after 13 games, they lost their final three games of the season to miss the playoffs for the second consecutive season. The 2000 season was considered a make-or-break season for Fassel. Like his predecessor, Dan Reeves, Fassel had enjoyed great success in his first year, but disappointment in the following two seasons. The conventional wisdom was that the Giants needed to have a strong year for Fassel to retain his job. The Giants' big draft acquisition was running back Ron Dayne, Heisman Trophy winner from the University of Wisconsin–Madison. Before the draft the team was debating whether to select Dayne or Shaun Alexander. The plan for Dayne was that the power running style he had at Wisconsin would complement Barber's speed and pass-catching ability. The two were dubbed "Thunder and Lightning". After back-to-back November losses at home against St. Louis and Detroit dropped them to 7–4, the Giants playoff prospects were in question. In what would be his defining moment as Giants head coach, at a press conference following the Giants' loss to Detroit, Fassel guaranteed that "This team is going to the playoffs." The Giants responded, winning the next week's game against Arizona and the rest of their regular season games to finish the season 12–4 and earn a bye as the NFC's top seed. This team was referred to as the worst team ever to win the home-field advantage in the National Football League. And today, on our field of painted mud, we proved we're the worst team ever to win the NFC championship. In two weeks, we're going to try to become the worst team ever to win the Super Bowl. Though the Giants kept the game close in the first half, and went into halftime down 10–0, the Ravens dominated the second half. Their defense (led by game MVP Ray Lewis) frustrated Kerry Collins all game long, resulting in Collins turning in one of the worst playoff performances in Super Bowl history. Collins completed 15 of 39 passes for 112 yards and 4 interceptions. The Ravens won the game 34–7 in one of the most lopsided Super Bowls ever. The lone Giants score came on a Ron Dixon kickoff return for a touchdown. On the very next kickoff, the Ravens countered as Jermaine Lewis also returned a kickoff for a touchdown. The Giants were unable to build on their Super Bowl success in 2001, finishing the season 7–9 and out of the playoffs for the third time in four seasons. Kerry Collins continued to have success as the Giants' starting quarterback, throwing for over 3,700 yards and 19 TD's. Tiki Barber finished as the Giants leading rusher again, while tying Amani Toomer for the team lead with 72 receptions. But the standout player of the Giants 2001 season was Michael Strahan. Strahan set an NFL record by recording 22.5 sacks during the season, and won the NFL Defensive Player of the Year Award. He broke the 17-year-old NFL record held by Mark Gastineau. The 2002 season saw the arrival of tight end Jeremy Shockey from the University of Miami, who provided Kerry Collins with yet another target. Collins would enjoy one of his best seasons as a pro in 2002, throwing for over 4,000 yards. Tiki Barber had his best season to date, rushing for 1386 yards and also catching 69 passes for 597 yards. The Giants started the season at 6–6, after which Fassel removed playcalling duties from offensive coordinator Sean Payton. The team responded to win their final four games to finish the year 10–6, and secure a first-round playoff game against the NFC West champion San Francisco 49ers. The Giants controlled the 49ers throughout the game, and with four minutes left in the third quarter held a 38–14 lead, which would have been even larger had not Shockey dropped a touchdown pass in the third quarter. The 49ers rallied however, scoring a field goal and three touchdowns—two on Jeff Garcia touchdown passes, one on a Garcia 14-yard touchdown run, and two two-point conversions made by Terrell Owens—which gave the 49ers a 39–38 lead with a minute to go. Collins then drove the Giants down to the 49ers 23-yard line with six seconds to play, setting up a 41-yard potential game-winning field goal attempt by Matt Bryant. However, Bryant never got an opportunity to make the kick. 40-year-old long snapper Trey Junkin—who had been signed out of retirement for this playoff game—snapped the ball low and punter Matt Allen could not spot the ball for the attempt. With no other options, Allen threw it downfield to offensive lineman Rich Seubert. The Giants were penalized for an illegal man downfield (Seubert), and the game was over. However, after the game, the NFL recognized that San Francisco should have been penalized on that play as well for pass interference. This would have created offsetting penalties and given New York a chance to kick again. After the game a devastated Junkin said "I cost 58 guys a chance to go to the Super Bowl. I'd give anything in the world, except my family at this point, right now to still be retired." The loss was Fassel's second devastating playoff loss in three postseason appearances; following the season, Payton was not retained as offensive coordinator. The Giants started out the 2003 season 4–4, but lost their final eight games to finish 4–12. This included seven consecutive losses in the second half of the season, in which the Giants failed to score more than 13 points. With two games remaining in the season, Fassel requested a meeting with team management, and asked, if he was to be fired, that they do so now rather than wait until the end of the season. Management complied with his request, and fired Fassel on (or around) Dec. 17, 2003. However, in an unusual turn of events, the Giants agreed to allow him coach the team for the remainder of the season so long as Fassel assured them that the team would not "quit" on him. Coming out of Ole Miss in 2004 Eli Manning was the prized draft pick in that year's draft. After a brief search, Ernie Accorsi hired Tom Coughlin, a one-time assistant of former Giants' coach Bill Parcells, to be the Giants new head coach. Coughlin had been the inaugural head coach of the Jacksonville Jaguars, and led them to the AFC championship game twice. He became the 16th head coach in franchise history. His stark, disciplinarian methods contrasted with the lax style employed by the departed Fassel. The Giants decided that their primary need was a franchise quarterback. Accorsi—who had coveted John Elway when he was Colts general manager in 1983—saw University of Mississippi quarterback Eli Manning as a similar talent. Manning's brother Peyton, and his father Archie, had already established successful careers as NFL quarterbacks. Though Accorsi wanted Manning, and Manning wanted to play in New York, Accorsi was unable to reach a deal to trade up to acquire him with the San Diego Chargers, who then used the first pick on Manning. Manning had indicated before the draft that he did not want to play for the Chargers, and appeared unhappy when selected by them. After the pick was made, Chargers general manager AJ Smith called Accorsi to make a deal. Part of the deal was that the Giants would select quarterback Philip Rivers out of North Carolina State University with the fourth pick overall and trade that pick, plus other selections (including the Giants first round pick the following year), to the Chargers for Manning's rights and additional considerations. When the trade was announced, the crowd in attendance at the draft (which was held in New York) cheered. When Kerry Collins made it known that he did not want to stay with the Giants until they eventually demoted him for Manning, the Giants released Collins. They later signed quarterback Kurt Warner, to serve as the interim quarterback until Manning was deemed ready to play. Warner had led the St. Louis Rams to two Super Bowls, winning one of them. However, Warner had been affected by injuries, specifically a broken hand, which reduced his effectiveness and led to his release by the Rams. After losing the 2004 season opener, the Giants, behind Warner, went on to win five of their next six games to stand at 5–2. The Giants then lost two close games, to the Bears and Cardinals, to drop to 5–4. It was at this point that Coughlin announced that Eli Manning would become the starter for the rest of the season. Manning struggled in his first four starts, and the Giants did not score more than 14 points in any game. However, they played better in narrow losses to the Pittsburgh Steelers and the Cincinnati Bengals. The Giants won their final game of the year against rival Dallas, to finish the season 6–10. Top performers on the season included Tiki Barber, who established a personal career high in rushing yardage with 1,518 yards, and also contributed 52 catches and 15 touchdowns. Following the season Ron Dayne was released. Dayne had experienced several mediocre seasons while Shaun Alexander, who the Giants bypassed to draft Dayne, had developed into a consistent Pro Bowler. The Giants won their first two games of the 2005 season, 42–19, against the Arizona Cardinals and 27–10, against the New Orleans Saints. The Giants lost to the Chargers the following week, 45–23, in a game which was marked by Chargers fans booing and jeering Eli Manning. They rebounded the following week, beating the St. Louis Rams by a score of 44–24. On October 25, 2005, Giants patriarch Wellington Mara died at the age of 89. Mara had been involved with the Giants since he was 9 years old, when he was a ball boy for the Giants. The Giants dedicated their next game to Mara, and shut out the Washington Redskins 36–0. 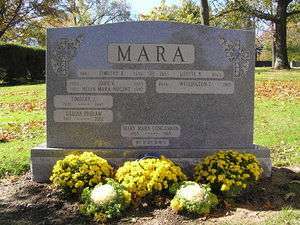 Just twenty days after Mara's death, on November 15, 2005, the other Giants Executive Officer and well-known businessman Preston Robert Tisch died at the age of 79. The Giants then lost 24–21 to the Seahawks when kicker Josh Brown kicked a 36-yard game-winning field goal. They then defeated the Cowboys 17–10. The Giants defense made opposing QB Drew Bledsoe go 15 of 39 for 146 yards with only one touchdown pass and two interceptions. On December 17, 2005, in their 27–17 home victory against the Kansas City Chiefs, Tiki Barber set the team's single game rushing yard record with 220 yards, breaking the previous record of 218 yards, which had been set by Gene Roberts on November 12, 1950. The Giants won the NFC East title for the first time since 2000 with a 30–21 win against the Oakland Raiders in the final game of the season. The Giants lost 23–0 to the Carolina Panthers in the first round of the playoffs however. The 2005 Giants had five pro bowlers, including Barber (who set a team record in rushing yards during the season), Shockey, Strahan, Defensive End Osi Umenyiora, and Special teamer David Tyree. In late September it was also announced that the New York Giants, New York Jets and the New Jersey Sports and Exhibition Authority had reached an agreement where both teams will work together to build a new stadium adjacent to the current Giants Stadium. The Giants regressed to an 8–8 season in 2006. The season featured inconsistent play, criticism of the coaching by the media and players, and inconsistent play from Manning. The Giants won five consecutive games following a 1–2 start to gain a two-game advantage in the NFC Eastern Division, but then key injuries to the offense and defense took their toll. Frustrations with the lack of production and with head coach Tom Coughlin began to surface as the Giants lost six of eight in the second half the season. The most disappointing loss of the season was a 24–21 defeat to Tennessee, in which the team surrendered a 21-point fourth-quarter advantage. Following a season-ending win at Washington, the Giants claimed a wildcard berth in the NFC playoffs, but were defeated in the first round by Philadelphia. In his final season before retirement, Tiki Barber led the Giants with 1,662 yards and over 2,000 yards from scrimmage, Eli Manning threw for 3,244 yards and 24 touchdowns and Jeremy Shockey led the team in receptions. Defensively the team struggled all season long with pass defense (28th in the league) and with gaining a consistent pass rush. David Tyree playfully re-enacts his famous catch for the cameras at the Giants' championship rally. In 2007, the Giants started 0–2 before winning their next six, making them only the second team in NFL history to accomplish that feat (the 1993 Dallas Cowboys were the other), and made the playoffs for the third consecutive season. In a game against the Eagles on September 30, the Giants tied the record for most sacks as a team in an NFL game, after sacking Philadelphia Eagles quarterback Donovan McNabb 12 times, with 6 of these coming from Osi Umenyiora. The Giants became the third NFL franchise to win at least 600 games when they defeated the Atlanta Falcons in an October Monday Night Football game 31–10. The Giants defeated the Miami Dolphins 13–10 in week eight in London's Wembley Stadium; the game was the first NFL regular-season game to be played outside of North America. The Giants made the NFL Playoffs with a 10–6 record and played the Tampa Bay Buccaneers in the NFC Wild Card Playoffs. They avenged a third playoff loss from Buccaneers QB Jeff Garcia by beating them 24–14. Eli Manning earned his first playoff victory and Tom Coughlin picked up his first playoff victory as coach of the Giants. The next week the Giants defeated their division rival and NFC top seed Dallas Cowboys, winning their ninth consecutive road game. In the NFC championship, kicker Lawrence Tynes made a final field goal for a 23–20 overtime win over the Packers in Green Bay. This made the Giants 4–0 in NFC championship games, and they advanced to Super Bowl XLII. In Super Bowl XLII on February 3, 2008, the New York Giants defeated the New England Patriots 17–14. The biggest play of the game was on third down on the Giants 44-yard line with 1:15 remaining. They were down 14–10 After the snap, Manning ran back and was surrounded by a cloud of defenders. Escaping three near sacks, he made a miraculous pass to David Tyree, who caught the ball against his own helmet, while being covered by veteran defender Rodney Harrison. This set up the Giants' final touchdown to win. Eli Manning was named MVP, completing 19 of 34 passes for 255 yards along with two touchdowns. The Giants pulled off one of the biggest upsets in Super Bowl history by handing the New England Patriots their first loss of the season and preventing them from becoming only the second team in the Super Bowl era to finish undefeated.Plaxico Burress hauled in the game-winning touchdown pass with 35 seconds left to play to give the Giants their first Super Bowl win since 1990. This game was also a rematch of their final regular season game, in which the Patriots came back from a 12-point deficit to finish the regular season 16–0. A parade was held in the Canyon of Heroes of Lower Manhattan two days after the win, followed by a victory rally across the Hudson River inside Giants Stadium in East Rutherford, New Jersey. An aerial shot showing the construction of the Giants new stadium (on the left) alongside their old home field in July 2009. The Giants won their Division again in 2008, with a record of 12–4 and earned themselves a first round bye and the No. 1 seed in the NFC. The Giants won 11 out for their first 12 games before stumbling to lose four of their final five including a 23–11 loss to the Eagles in the NFC Divisional Round. Manning was named to the Pro Bowl after the season, in a year where he threw for 3,238 yards, 21 touchdowns, and 10 interceptions. Other standouts included Brandon Jacobs and Derrick Ward who both rushed for 1,000 yards, as the Giants led the NFL in rushing yards. Justin Tuck led the team with 12 sacks, while Antonio Pierce was the team's leading tackler. The Giants featured a balanced offense with no receiver topping 600 receiving yards; the team also set a then-NFL record for fewest turnovers committed in the regular season with 13. The year marked a changing of the guard on the defensive line as Giants careers sack leader Michael Strahan retired before the season. The 2009 season began with the Giants winning their first five games, but then dropped the next four. After beating the Falcons in overtime, they were routed by the Broncos on Thanksgiving. The Week 13 game with Dallas brought a 31–24 victory, but was followed by a 45–38 loss to Philadelphia. The Giants nonetheless remained in the playoff picture until being defeated by the Panthers 41-9 in Week 16, in the last Giants home game at Giants Stadium. They then ended the year with an 8–8 record after a loss in Minnesota. In the spring of 2010, the new Meadowlands Stadium was completed and the Giants and Jets opened it in August with their annual preseason match. During the summer, Bob Sheppard, the Giants' public address announcer from 1956 to 2005, died on July 11. The 2010 season would be dedicated to Sheppard's memory. In the regular season, New York inaugurated their new home by beating Carolina 31–18. Peyton outplayed Eli in the second "Manning Bowl" and the Colts won 38–14 in week two. Discipline became a growing problem during the early portion of the season. In the Colts' game, Jacobs threw his helmet into the stands, and in the next week's game with Tennessee (a 29–10 loss at home) New York committed five personal fouls. The Giants next hosted the Bears on Sunday Night and won 17–3. After a win at Houston, the Giants then won their next three games to improve to 6–2. Their Week 14 game with Minnesota was scheduled for Sunday, December 12, but the Vikings' stadium roof collapsed, and the game was moved to Detroit, where New York won 21–3. Against the Eagles in the next week, the Giants lost a 21-point fourth quarter lead and the game when Eagles receiver DeSean Jackson returned it for a 65-yard game touchdown on the game's final play, in a match later dubbed the "Miracle at the New Meadowlands." The Giants finished the season 10–6, but missed the playoffs, the first time since 1988 that the franchise had won ten games in a season without making the playoffs. This was the sixth consecutive season the Giants finished with at least a .500 regular season record (2005–2010), the team's longest stretch since the NFL-AFL merger. As the Giants began 2011, many NFL analysts predicted that the Philadelphia Eagles were a favorite to win the NFC East title, while the Giants were not expected to make the playoffs. The Giants opened their regular season against the Washington Redskins on September 11, 2011, and lost in FedEx Field 28–14. The Giants then won three straight games, including breaking their six-game losing streak to Philadelphia. By Week 9, New York was 6–2 after beating the Patriots in Foxboro for their first encounter since Super Bowl XLII. At this point however, they entered a difficult stretch of games and lost four straight to a resurgent 49ers, followed by the Eagles, Saints, and Packers. By now, the Giants found their chances of beating Dallas to the division title fading and Tom Coughlin's coaching abilities were increasingly called into question despite reassurances from team president John Mara that there were no plans to fire him. However, the Giants kept their playoff hopes alive in Week 14 by beating the Cowboys in Dallas on a last-second scoring drive led by Eli Manning and extending their win streak in Cowboys Stadium to three straight games. Despite another loss to the Redskins afterwards, the Giants defeated the New York Jets in Week 16 by a final score of 29-14, also eliminating the Eagles from playoff contention, to set up a rematch with the Dallas Cowboys in which the winner would win the NFC East. The game was later flexed into Sunday Night Football. The Giants beat the Cowboys 31–14 to win the NFC East with a record of 9-7. Throughout the regular season, Eli Manning (always viewed as a weak QB compared to his brother) put up some of the best stats of his career. During the wild card round of the playoffs, the Giants hosted Atlanta Falcons and won 24–2, with the Falcons' only score from a safety due to Eli Manning being flagged for grounding in the end zone. In the divisional round, the Giants were forced to play the defending champion Green Bay Packers in Lambeau Field. The Packers had finished the regular season with a league-best 15-1 record, including a 38-35 win against the Giants in Week 13. In addition, the Packers received a first-round bye, and thus this was their first playoff match. Despite these obstacles, the Giants handily defeated the Packers 37-20 to qualify for the NFC Championship Game against the San Francisco 49ers. With the score tied 17-17 in regulation, the Giants moved into field goal range in overtime and Lawrence Tynes, the hero of the 2007 postseason, kicked a 20-yard field goal to send them to Super Bowl XLVI, a rematch against the New England Patriots. Once again facing the New England Patriots, the New York Giants headed to Lucas Oil Stadium, home of Eli's brother Peyton's team, the Indianapolis Colts. The Giants got off to an early lead by an intentional grounding call on Tom Brady in the end zone for a safety and retaining the ball for most of the 1st quarter. However, New England came back and battled to a 10–9 lead. Nearing the end of the 4th quarter with the Giants behind 17–15, Patriots coach Bill Belichick allowed them to score a touchdown with the idea that they would have nearly a minute to drive downfield and score. However, the New York defense held and broke up several Brady pass attempts. A last-second throw into the end zone by the Patriots QB was thwarted and the Giants had won their second Super Bowl 21–17 in four years at New England's expense. After several disappointing seasons, Coughlin retired after the end of the 2015 season as head coach and replaced with previous offensive coordinator Ben McAdoo. 1 2 3 1994 New York Giants, databasefootball.com, Retrieved March 20, 2007. ↑ Berkow, Ira. Sports of The Times; Brown Hopes To Wear Out Giant Fans, The New York Times, October 25, 1994, Retrieved March 22, 2008. 1 2 New York Giants (1925 – ), databasefootball.com, Retrieved March 17, 2007. ↑ Rodney Hampton, databasefootball.com, Retrieved March 20, 2007. 1 2 1995 New York Giants, databasefootball.com, Retrieved March 20, 2007. ↑ Smith, Timothy W. On Pro Football;As His Team Sinks, a Coach Talks of Jumping Ship, The New York Times, November 20, 1995, accessed December 6, 2010. 1 2 3 4 5 6 7 8 9 10 11 12 13 14 15 16 History of the New York Giants www.sportsecyclopedia.com, Retrieved September 12, 2006. ↑ Sandomir, Richard. PRO FOOTBALL;Giants Will Confiscate Season Tickets, The New York Times, December 27, 1995, Retrieved March 22, 2008. ↑ 1995 New York Giants, pro-football-reference.com, Retrieved March 22, 2007. ↑ Dave Brown, databasefootball.com, Retrieved March 18, 2007. ↑ Anderson, Dave. 'It Hasn't Worked Out' For Reeves, New York Times, December 22, 1996, Retrieved March 22, 2008. 1 2 3 1997 New York Giants, accessed databasefootball.com, Retrieved March 18, 2007. ↑ Mizell, Hubert. Don’t mistake where Accorsi’s rooting interest is, St. Petersburg Times, January 22, 2001, Retrieved March 20, 2007. 1 2 1998 New York Giants, pro-football-reference.com, Retrieved March 21, 2007. 1 2 King, Peter. Renewed and revitalized at 28, Collins finally comes clean, sportsillustrated.cnn.com, January 22, 2001, Retrieved March 21, 2007. 1 2 Pompei, Dan. Collins is a low-risk signing for the QB-starved Giants—Kerry Collins signs with New York Giants; Nolan Harrison; related NFL news, The Sporting News, March 8, 1999, Retrieved March 20, 2007. 1 2 3 4 5 6 1999 New York Giants, Retrieved March 18, 2007. ↑ Anderson, Dave. Sports of The Times; Fassel and Groh on the Spot, Even Before the Season, The New York Times, September 3, 2000, Retrieved October 20, 2010. ↑ Myers, Gary. GROH, FASSEL HAVE MADE GIANT STEPS, The New York Daily News, August 18, 2000, Retrieved October 20, 2010. ↑ Pennington, Bill. PRO FOOTBALL; Giants Might Choose Between Alexander and Dayne, The New York Times, April 12, 2000, Retrieved March 22, 2008. ↑ Pompei, Dan. Thunder and Lightning become a flammable mix, The Sporting News (accessed via findarticles.com), September 25, 2000, Retrieved November 24, 2010. 1 2 3 4 2000 New York Giants, databasefootball.com, Retrieved March 21, 2007. ↑ Wilner, Barry. Giants pound Vikings into submission, USA Today, January 21, 2001, Retrieved March 21, 2007. ↑ Super Bowl XXXV, footballreference.com, accessed October 5, 2010. 1 2 3 2001 New York Giants, databasefootball.com, Retrieved March 20, 2007. 1 2 Associated Press. Strahan breaks Gastineau's 17-year-old record, espn.com, January, 2001, Retrieved March 11, 2009. 1 2 3 2002 New York Giants, databasefootball.com, Retrieved March 17, 2007. 1 2 3 4 5 6 Associated Press. Garcia, 49ers erase 24-point deficit, espn.com, January 5, 2003, Retrieved March 22, 2007. 1 2 2003 New York Giants, databasefootball.com, Retrieved March 17, 2007. ↑ Associated Press. Fassel wants another coaching job, December 19, 2003, Retrieved March 23, 2007. ↑ History of the New York Giants, giants.com/history, Retrieved May 24, 2007. ↑ Pennington, Bill. PRO FOOTBALL; A Strict Colonel Tom Is What's Necessary, The New York Times, January 7, 2004, Retrieved March 22, 2008. * NYG Team Report, scout.com, December 16, 2003, Retrieved May 24, 2007. 1 2 3 Magee, Jerry. Nothing personal, San Diego; Eli Manning just didn't want to be a Charger, San Diego Union-Tribune, September 21, 2005, Retrieved March 21, 2007. ↑ Zinser, Lynn. PRO FOOTBALL; Manning's Day Gets Miles Better After a Trade to the Giants, The New York Times, April 24, 2005, Retrieved October 27, 2010. ↑ Zinser, Lynn. FOOTBALL; Giants Check Out Warner. Warner Checks Out Giants., The New York Times, May 12, 2004, Retrieved March 22, 2008. 1 2 3 4 5 2004 New York Giants, databasefootball.com, Retrieved March 21, 2007. 1 2 2005 New York Giants, databasefootball.com, Retrieved March 16, 2007. ↑ Goldstein, Richard. Wellington Mara, the Patriarch of the N.F.L., Dies at 89, The New York Times, October 26, 2005, Retrieved April 17, 2007. ↑ Associated Press. Three missed FGs doom Giants in OT loss to Seahawks, espn.com, November 27, 2005, Retrieved March 21, 2007. 1 2 Associated Press. Giants alone atop NFC East after narrow win vs. 'Boys, December 4, 2005, Retrieved March 21, 2007. ↑ Associated Press. Tiki torches Chiefs in Giants' win, December 17, 2005, Retrieved March 21, 2007. ↑ New York Giants Rushing Single-season Register, footballreference.com, accessed October 5, 2010. ↑ 2005 New York Giants, pro-football-reference.com, Retrieved March 21, 2007. ↑ Eichelberger, Curtis. Jets and Giants Stadium announcement, scout.com, September 29, 2005, Retrieved October 27, 2010. 1 2 3 4 2006 New York Giants Schedule, espn.com, Retrieved March 21, 2007. ↑ Branch, John. PRO FOOTBALL; After All That Turmoil, the Giants Now Seem Likely to Stay the Course, The New York Times, January 14, 2007, Retrieved March 22, 2008. 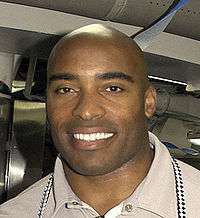 ↑ Tiki Barber, espn.com, Retrieved March 21, 2007. 1 2 2006 New York Giants player stats, espn.com, Retrieved March 21, 2007. ↑ 2006 NFL Opposition and Defensive stats, footballreference.com, Retrieved October 27, 2010. 1 2 New York Giants, footballreference.com, accessed October 5, 2010. ↑ Associated Press. Umenyiora helps Giants tie sack record in 16–3 win over Eagles, ESPN, October 1, 2007, accessed October 4, 2010. ↑ Foley, Phil. Burress helps Giants wallop Falcons, giants.com, October 15, 2007, Retrieved October 27, 2010. ↑ Wickersham, Seth. Sorry, Brits, but Giants-Dolphins was typical NFL, ESPN, October 28, 2007, Retrieved October 27, 2010. 1 2 3 2007 New York Giants, footballreference.com, accessed October 5, 2010. ↑ New York Giants 23 at Green Bay Packers 20, football reference.com, October 5, 2010. ↑ New York Giants 17 vs. New England Patriots 14, football reference.com, accessed October 5, 2010. 1 2 2008 NFL Standings, Team & Offensive Statistics, footballreference.com, accessed October 5, 2010. 1 2 3 4 5 2008 New York Giants, footballreference.com, October 5, 2010. 1 2 2009 New York Giants, footballreference.com, October 5, 2010. ↑ 2009 NFL Standings, Team & Offensive Statistics, footballreference.com, accessed October 5, 2010. 1 2 Goldstein, Richard (July 12, 2010). "Bob Sheppard, Voice of the Yankees, Dies at 99". The New York Times. ↑ Associated Press. DEs Osi Umenyiora, Justin Tuck claim spotlight as Giants hand Bears first loss, espn.com, October 3, 2010, accessed October 9, 2010. ↑ McLane, Jeff (December 20, 2010). "Eagles' 'Miracle at New Meadowlands' beats Giants for NFC East lead". The Philadelphia Enquirer. p. A1. Archived from the original on December 25, 2010. Retrieved December 21, 2010.